Play.com have pre-empted Amazon’s DRM-free mp3 service with their own shop. And I’m pleased to see my EMI album on there for a bit cheaper than you can get it on iTunes. Well… four pence cheaper! Also, it’s iTunes Plus so there’s no DRM on that download either. 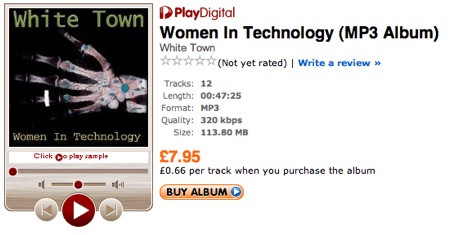 But if you’re anti-Apple or simply prefer downloaded mp3s, check out the Play.com shop!